Online ticket booking software for bus, train, ferries and tours is now available at AddTransit. Easily add your schedule, key stops and fares, add a link to your website and you are up and running! In the past, you had to hire web specialists to create custom ticketing systems for you, but now with AddTransit you can be set up and running quickly. You can focus on the things that matter, while tickets are sold online. Of course, there are administration functions that allow you to monitor bookings, capacity and make changes to bookings if passengers need assistance. 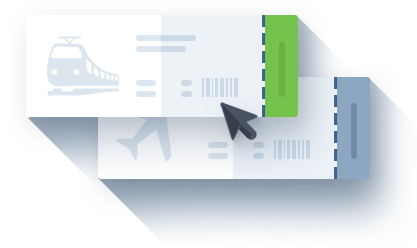 The benefits of online ticket booking software means that reservations for your bus, train or ferry service or bookings for your tours, can be managed by the customers themselves. This allows them 24×7 flexibility in booking 365 days of the year, removes the need to queue at your ticket counters, and allows your staff to focus on providing greater value. We encourage you to try AddTransit for yourself. Creating a General Transit Feed Specification (GTFS Spec) file can be done a number of ways. If it is a small company with only one or two routes with only a few trips a month, then you can use a simple editor. You can limit the file to just the route, stop, and timetable information. If it is a little more complex, then you can use a product like excel or an excel tool to create the file. This helps, but very quickly can be challenging as you need to ensure all the relevant files that get zipped up to make a GTFS file are all aligned. e.g. You need to make sure there are no typos and consistency is key. Of course with these first two methods you will need to learn the General Transit Feed Specification (GTFS Spec) in detail. For most people who are small, this is definitely not their core business. Your real business is ensuring passengers get from A to B, comfortable and efficiently with good financial outcomes, and anything that takes you away from this function is a needless distraction. The next solution is a GTFS Editor such as AddTransit. These take away the complexity of the General Transit Feed Specification (GTFS Spec), leave you to enter the data that matters to you and are low cost. e.g. Your stops, your routes, your timetable. Additionally, it makes consistency and updates easier, reduces the time to create and maintain the GTFS file, and offers the fare, transfer and detail information for when your ready. And if you want to take your business to the next level, you could add on real time status updates and vehicle tracking. Of course, if you have budgets in the hundreds of thousands, there are also the premium products which offer good solutions but at many times the price. Obviously, we are a little biased here at AddTransit, as we think an online GTFS Editor is the best solution for most companies and that’s why we work hard each day to make it easier for you.